In running any business, collecting and paying sales tax in the state of New York can become overwhelming. We have put together this guide so that anyone can be prepared to meet the tax requirements for the state of New York. 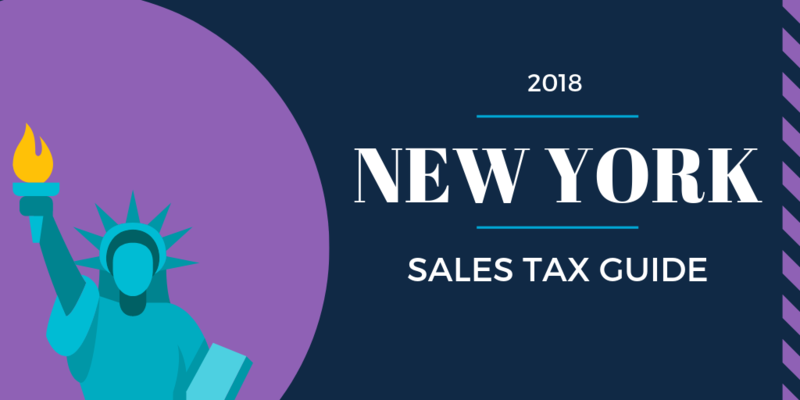 Our New York Sales Tax Guide will give you the confidence to manage your New York sales tax needs from beginning to end. If you have any other questions to help you determine your sales tax obligations in New York and how to fulfill them, we are here for you. ☐ Have you wanted to contact the New York Department of Taxation and Finance? If you have answered “Yes” to any of these questions, we have the answers for you. You may contact the New York Department of Taxation and Finance at 518-485-2889. You will want to contact the New York Department of Taxation directly by phone to have your questions answered even though there are online options to do certain tasks such as registering for a sales tax license and they provide mailing addresses if you want to send a letter through the mail. To expedite the process, it is best to contact them by phone. It is better to wait on hold than to wait weeks for a response through the mail. If you are calling on someone else’s behalf whether an individual or a business, you must have a New York Power of Attorney signed before you call or else you risk wasting your time. Technically, a representative would not be authorized to talk to you unless you have this available. Are you a new business selling tangible items in the state of New York? If so, you need to register for a Certificate of Authority. Trust me! There is no reason to worry. You only need to do this once. and it will be over with as long as there are no major changes (such as change in ownership or structure) to your business that require you to renew or make changes to your Certificate of Authority. We are going to detail the steps below so you are ready to register for you Certificate of Authority. How to apply for a Certificate of Authority in New York? Where to apply for a Certificate of Authority in New York? What information is required for a Certificate of Authority in New York? How much does it cost to register for a Certificate of Authority in New York? Are there any other requirements to register for a for a Certificate of Authority in New York such as a Tax ID or obligations to register with other agencies? We have found that our clients frequently ask these essential questions. To help you be prepared for your first time registering, we are going to give you the knowledge you need. 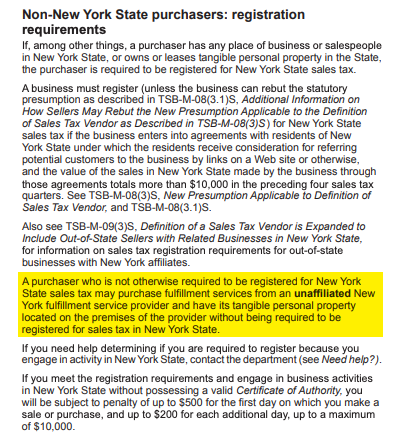 How do I register to collect sales tax in New York? New businesses may apply or register for a New York Certificate of Authority by visiting the New York Department of Taxation and Finance and following the instructions provided. To apply for a Certificate of Authority, use New York Business Express. After you click submit, your application will be processed and evaluated by the New York Department of Taxation and Finance. If approved, they will mail your Certificate of Authority to you at the address you provided. You cannot legally make any taxable sales until you have received your Certificate of Authority. When you apply for the Certificate of Authority, you may notice there are two types of certificates. In New York, there is a regular and temporary Certificate of Authority based on how long you are expected to be in operation. In other words, it is based on the expected duration of your business activities. You do not need to worry about looking for two different application forms when you initially register. You can use the same application for either certificate. If you apply for a temporary certificate, the New York Department of Taxation will issue a beginning and ending date based on the information you provided in the application. When do you qualify for a regular Certificate of Authority in New York? If you are making taxable sales from any of the following types of facilities, you must register for a regular certificate. any other facility from which you regularly conduct your business. It does not matter whether you own or rent the facility in which you regularly conduct your business. You need to still apply. Now, let’s look deeper at the temporary Certificate of Authority. When do you qualify for a temporary Certificate of Authority in New York? If you expect to only make taxable sales in New York State for at most two consecutive sales tax quarters in any 12-month period. If you think you may continue to make sales past two consecutive tax quarters, you need to apply for a regular Certificate of Authority. So, now you are probably asking yourself… what are the tax quarters in New York State? Q4: December 1 through February 28 (February 29 in a leap year). When requesting a temporary Certificate of Authority, you must indicate when you expect your business operation to begin and end. The temporary certificate will only authorize you to collect tax and conduct your business between those dates. Even though you use the same application as the regular certificate, it is important that you remember to provide this information to avoid any unnecessary delays in getting your application approved. You also have to think about how long you want to file paperwork reporting your sales taxes for New York State. You may not want to have a Certificate of Authority to collect sales taxes in New York longer than needed. Maybe you don’t have any sales tax to collect and pay after the second consecutive tax quarter. If you have a regular certificate, New York State would still expect you to fulfill your tax obligations by meeting filing deadlines. Now that we have gone over the basics of regular and temporary Certificates of Authority, let’s talk about how to choose between the two. There may be times when you want to have a regular certificate even though you qualify for a temporary one. While there may be more responsibilities that come with a regular certificate, it is sometimes better to go through the application process one time. Remember, you can have this certificate as long as your business is operating and you do not need to make any changes to your registration if there are no significant changes to your business. Rather than wait for another application for a temporary certificate to get approved, you can just have a regular one without the headache of registering again and again. At the same time, you can avoid having to turn down sales because you are legally not authorized to collect sales taxes. Overall, a regular certificate provides flexibility to continue your business without reapplying for a Certificate of Authority each time you begin making sales in the state of New York again. There are also restrictions on the number of temporary Certificates of Authority you can register for. You may not apply for more than one temporary Certificate of Authority for any 12-month period. What if you sell your products at a show or entertainment event (such as a craft show, antique show, flea market, or sporting event)? Can you just apply for a temporary Certificate of Authority since you can say you only sell products at such events occasionally? Or is it so rare that you sell products at such events that you can say it is an isolated event? Here is an area where there can be some confusion. Even though it is a one-time event or you may rarely attend such events, you must apply for a regular Certificate of Authority. It is irrelevant that your sales are only on an isolated or occasional basis. When it comes to determining which certificate to apply for, you need to factor in how many quarters you expect to make sales and whether you want the flexibility of the regular Certificate of Authority. What if your business has multiple locations? You must have a Certificate of Authority for each business location. Even though you need a separate certificate for each, you can choose to file one sales tax return for combined sales at all locations. You can also decide to file a separate return for each location. Do your business locations operate under one entity or are they treated as separate business entities? While you can file one return for combined sales at multiple business locations, you can only do so if all the business locations fall under one business entity. In this case, you can register all the locations using New York Business Express. The State of New York will process your application and send you a Certificate of Authority for each location, all containing the same sales tax identification number. If you plan to operate your business locations as separate business entities, you need to file separate applications for individual Certificates of Authority for each location. You would then file a return for each business entity. Remember, you cannot combine sales in this instance. What happens if you open a new location? This is easy. You should already be a registered vendor. You will be able to combine your sales information and file a consolidated return if you so choose. When adding a new location, you need to provide your current sales tax identification number along with the address of your additional location. What information is needed to register for a New York Certificate of Authority? Don’t forget-- Preparation is key! When you have all this information at the ready, you can register for your Certificate of Authority at the NY Business Express website. How much does it cost to register for a New York Certificate of Authority? We love the answer to this question! There is no cost to register for a Certificate of Authority to collect sales taxes in New York State. Do I need a Federal Tax ID Number or EIN to register for A New York Certificate Of Authority? Yes! Yes! Yes! It is absolutely required to have a Federal Tax ID in order to register a New York Certificate of Authority. It's relatively painless, quick, and easy to apply for a federal EIN, so fret not. You can click here to register a new Federal EIN. Which agencies in New York do I need to additionally register with? This honestly requires some investigation on your end. Since every business is unique, there are different rules, regulations, and laws that apply. I suggest contacting the NY Dept. of Taxation and Finance to verify which government agencies you will be required to register with. You are now prepared to register for your Certificate of Authority in New York. Acquire a Federal tax ID (or EIN) before registering for a Certificate of Authority. Registering for your Certificate of Authority will be stress free as long as you prepare as we have advised. We recommend organizing all the essential information into both a hard-copy as well as a digitally mirrored equivalent so it is just a click away. By now, you may have communicated with the New York Department of Taxation and Finance and applied for a Certificate of Authority to collect and remit sales taxes in New York. At this time, you may be asking yourself, "When do I charge a sales tax?" It is quite common for new business owners to have questions regarding what goods are subject to sales taxes in New York, or any other state in which they are selling their products. We are going to go over some common questions that our clients has asked me. I believe these questions will help you appreciate the nuances of taxable goods so you can be confident in fulfilling your tax obligations. What products are considered taxable or not taxable in New York? As a new business, you want to keep in mind that both products and services can be subject to sales taxes. Sales tax does not apply to most services. If so, they are not taxable. Lastly, some clients ask our team about whether an exemption certificate can save them tax expense. An exempt use certificate can be of benefit for certain business owners and buyers as it enables a purchaser to make tax-free purchases that would otherwise be subject to sales tax. The types of transactions exempted are listed on the website. With an exempt certificate, the buyer needs to fill out Form ST-121 and give the seller a copy to keep on file. If you are selling a tangible product or service that is not exempt from sales taxes, you must charge sales taxes. Now that we have reviewed the nuances of taxable goods in New York state, let’s dig deeper into New York sales taxes. Is New York an Origin or Destination Sales Tax State? What creates a sales tax nexus in New York? What is the economic threshold in New York? Does Amazon have fulfillment centers in New York? Does New York have a Click-Thru Nexus? To better understand your tax obligations, new businesses need to consider how they are doing business and the type of relationships they have with buyers and any third parties to their transactions. Let’s discuss some questions that will help you understand the nature of your own business and the subsequent tax implications. New York is Destination Based Sales Tax State. As such, businesses must charge sales taxes based on where the buyer is located. If New York was an Origin Based Sales Tax state, you would charge based on where you were located. Protip: Charge New York sales tax based on the location of the buyer. So, you know New York is a destination-based sales tax state. What is left to know? Thresholds! New York has their thresholds that, once established, will require a business to collect New York sales taxes. These frequently asked questions illustrate the thresholds relevant to businesses looking to comply with New York tax law. Does New York have Economic Nexus? Does New York have a Click-Through Nexus? We will look at these questions in more detail. By the time we are done, you will be confident to recognize whether the manner in which you do business establishes a nexus with the state of New York. What creates sales tax nexus in New York? This is a very important question for not just New York-based business but one outside the state as well. Irrespective of your actual location, there are numerous ways a business can create a sales tax nexus with New York thereby becoming subject to New York tax law. A Sales Tax Nexus with New York is also known as "sufficient business presence.” In other words, if a business has in any way established a taxing connection with a state. When this happens, such a business is required to collect and remit sales tax in New York because of the Sales Tax Nexus. Even if a business maintains its main headquarters in another state, it may still have to charge and pay sales tax to the New York Department of Taxation and Finance absent stepping foot inside the state. So, how do you create a Sales Tax Nexus in New York? Let’s talk a bit more specifically about where your goods are stored such as in the instance of an Amazon warehouse. No! There a no Amazon fulfillment centers in New York.. Keep reading- the next answer will surprise you! What if your business is outside of New York and uses another fulfillment service (other than Amazon) to store and ship your products? You will still not create a nexus relationship with New York. The State of New York is a rare bird, in that they don't consider having your products housed and fulfilled in their state enough to create that connection. As long as you do not own the fulfillment center, the warehouse, or employ the workers, you are in the clear. This is the only state that we have seen this exception. No, though this is expected to change in 2019. While this is not an issue for businesses now in 2018, it is expected to be. So we are going to review the basics of economic nexus to help you feel prepared. Some states determine economic nexus based on gross revenue and the number of transactions generated in its state. You may want to keep this in mind for the future. For now, you do not need to worry about hitting this threshold. Does New York have click-through nexus? Yes, New York has Click-Through Nexus. Let’s discuss what a Click-Through Nexus is? A business hires an affiliate marketer in the state of New York, who may hire sales representatives in New York to help promote your products. The marketer and the sales representatives do not directly sell the products. They only advertise them. Your products never actually pass through their hands. Even though they do not directly sell your products, your business creates a Sales Tax Nexus that is specifically known as Click-Through Nexus. Your business used an affiliate marketer or sales person (individual or business) to refer your products or services to customers. Your business compensated this person or business either directly or indirectly for their service, which was referring customers to your company by website link or other methods of advertising or referral. The cumulative gross receipts from all the affiliate referrals combined exceeded $10,000. New York's current click-through nexus threshold $10,000 - period. Once you hit that amount, you have created a nexus relationship moving forward. 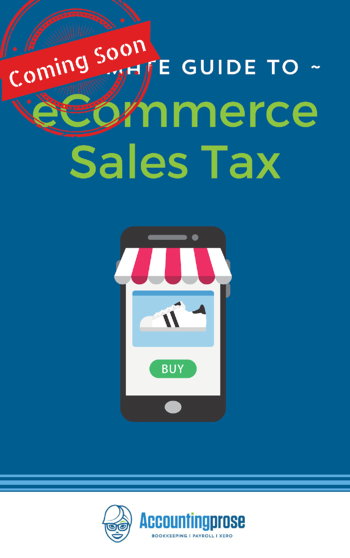 Protip: As the retailer, your business is ultimately responsible for collecting and remitting New York sales tax if your affiliate marketer's sales trigger Click-Through Nexus with New York state. Being aware of them and how they are created so you can collect and pay sales taxes as required in the state of New York. Doing so will help you avoid audits, fines, and repayments. Keep in mind, your eCommerce software will track where your product has been shipped from and where it is headed, so you should be able to easily see the volume of sales in both dollar amount and number. Is New York a streamlined sales tax state? Yes, New York participates in the Streamlined Sales Tax (STT) program, which makes collecting and remitting sales taxes even easier for businesses. Even though this program has not been implemented in all the 50 states, you are lucky that New York is one that is using the program. You should consider your business with the SST to make your sales tax life easier. Know when to charge sales tax in New York. Know if you creates a Sales Tax Nexus. Know if you established a Click Through Nexus. Take advantage of the Streamlined Sales Tax Program to make managing your taxes easier. Manage your tax needs more effectively by keeping this guide handy. You and your business can be better-equipped to avoid situations like paying fines, paying back taxes that you did know you had to pay in the first place, or facing an audit by the tax authorities in New York. If you are a business who has established a nexus with New York, you are required to collect sales tax in New York. Knowing this is just half the battle. Now, we are going to help you navigate the process of how to go about that. In fact, we are going to review some common questions our clients have asked regarding their New York sales tax obligations. How do I collect New York sales tax? Who is eligible for New York Sales Tax Exemptions? What should I do if my customer is exempt from sales tax in New York? What happens if I lose a New York sales tax exemption certificate? Remember when I said that New York is a Destination Based Sales Tax State. Then you only need to collect taxes based on the location of the buyer. So, if you live in New York, collect sales tax based on their location rather than your location. Your eCommerce software should be able to calculate this for you on the fly. What are the current New York sales tax rates? Since Sales Tax Rates change frequently- and vary by what is being sold, we are going to refer you to check out the New York Department of Taxation and Finance site here. You always want to double check the sales tax rates. What is exempt from New York sales tax? For more information, see Transactions that are not subject to sales tax for more details. Keep in mind, an exemption certificate enables a purchaser to make tax-free purchases that would normally be subject to sales tax. See Tax Bulletin Exemption Certificates for Sales Tax (TB-ST-240) for details. At this point, you should know what products are exempt from sales tax in New York. You also want to know who may be exempt. Under New York law, the type of buyer or the way the goods will be used can qualify can buyer for a sales tax exemption. A good example of this is a merchant purchasing goods for resale, aka a wholesaler. See Exemption Certificates for Sales Tax for more in-depth information regarding who qualifies for an exemption. It is up to you to collect a New York sales tax exemption certificate (Form ST-121) at the point of sale and to keep it on file. As a buyer, you should only accept the certificate if you have no reason to believe it is a fake. If you are audited and cannot produce an exemption certificate for a buyer, you may be held responsible under the ordinary care standard. As such, you would be responsible for paying any uncollected sales tax and potentially even late fees and interest. You only need to keep a copy of the certificate for at most three years, from the date that you were required to file the relevant return. See Exemption Certificates for Sales Tax for more details on what happens in the event you lose the tax exemption certificate. Does New York have a sales tax holiday? So, we have talked about who you need to collect sales taxes from, whether the goods you are selling are deemed taxable, what goods and services fall under tax exemptions, who is eligible for tax exemption certificates, and the process of collecting sales tax in New York state. I cannot emphasize this enough. For three years, keep a copy of any certificates exempting a buyer from sales tax. Being organized and prepared for any potential, hopefully not, audits is the key to managing your tax needs. When is New York sales tax due? What are the New York sales tax thresholds? What if a New York sales tax filing date falls on a weekend or holiday? How do I file a New York Sales Tax Return? How do I correct a New York sales tax return? Do I need to file a return if I don’t collect any sales tax in New York? Does the New York Department of Taxation and Finance offer a discount for filing on time? By the time you finish reading this, you will feel confident enough to file and pay your New York sales tax. You must file and pay your sales tax no later than the 20th day of the month following the period being reported. For example, you will need to pay December sales tax by January 20th to avoid penalties and interest. You owe $3,000 or less in tax during an annual filing period. Your taxable receipts, purchases subject to use tax, rents, and amusement charges are less than $300,000 during the previous quarter. Your combined total of taxable receipts, purchases subject to tax, rents, and amusement charges is $300,000 or more in a quarter. Watch your mail for a letter from the State of New York so that you don't miss any deadlines. The deadline is moved to the next business day, typically the Monday following the weekend or the day after the holiday. However, I always suggest filing before the holiday. If the answer is “Yes, Yes, Yes,” New York requires you to use WebFile to file sales tax returns. See Filing Requirements for Sales and Use Tax Returns for more information of how to use Web file. If you are required to Web File, you can submit payment electronically via EFT. If you do not meet these conditions for using Web File, paper forms are allowed. Complete form 809 (part-quarterly/monthly filers), form ST-100 (quarterly filers), or form ST-101 (annual filers). Enclose payment and mail to NYS Sales Tax Processing, PO Box 15169, Albany NY 12212-5169. You cannot amend a return with paper forms. Instead, you must amend your original return online and submit payment via EFT (if applicable). If you were required to collect sales taxes (nexus in New York and selling taxable goods or services to taxable residents) and failed to do so for whatever reason, you will be held responsible for the tax due. Always collect sales tax at the point of sale. Attempting to collect after the fact will be time consuming and most likely unsuccessful. Let’s talk about the scenario where a registered business has collected no sales tax in New York and fails to file a zero tax return (or missed their assigned due date)? Even though you did not have any sales taxes to remit, the penalty is $50 for filing a late return. Now, there is also the case where you file late and you owe taxes. What happens depends on how late you are in filing the return, and whether you pay taxes due at that time. If you are going to pay taxes at the time of filing late, you need to do the following based on how late you are. Are you late in filing your return by only 60 days or less? If so, you need to know the following. The minimum penalty for filing late is $50. No matter what, you will be paying at last a penalty fee in the amount of $50. It could be more though. Are you late in filing your return by more than 60 days? If so, you need to know the following. What happens if you filed your return on time but you did not pay the taxes due? In this case, you incur a penalty in the amount of 10% of the tax due for the first month plus 1% for each additional month or part of a month not to exceed 30%. What happens if you failed to report more than 25% of the taxes owed? In this case, the penalty is 10% of the tax you failed to report. Does the New York Department Of Taxation offer a discount for filing on time? Yes. The New York Department of Taxation and Finance currently offers a discount of 5% with a maximum of $200 per quarter and no minimum. Now that we covered all our bases for filing and paying sales taxes in the state of New York, you should feel more at ease about the process. If you don’t collect sales tax and you were supposed to, you (not the buyer) are liable to pay the sales tax to the state of New York. Now, you are ready to file and pay your sales tax in New York. If you have any more questions, feel free to contact us. Need more help with New York Sales Tax?